Citation Information: JCI Insight. 2017;2(5):e91327. https://doi.org/10.1172/jci.insight.91327. Pulmonary hypertension (PH) is a multifaceted vascular disease where development and severity are determined by both genetic and environmental factors. Over the past decade, there has been an acceleration of the discovery of molecular effectors that mediate PH pathogenesis, including large numbers of microRNA molecules that are expressed in pulmonary vascular cell types and exert system-wide regulatory functions in all aspects of vascular health and disease. Due to the inherent pleiotropy, overlap, and redundancy of these molecules, it has been challenging to define their integrated effects on overall disease manifestation. In this review, we summarize our current understanding of the roles of microRNAs in PH with an emphasis on potential methods to discern the hierarchical motifs governing their multifunctional and interconnected activities. Deciphering this higher order of regulatory structure will be crucial for overcoming the challenges of developing these molecules as biomarkers or therapeutic targets, in isolation or combination. 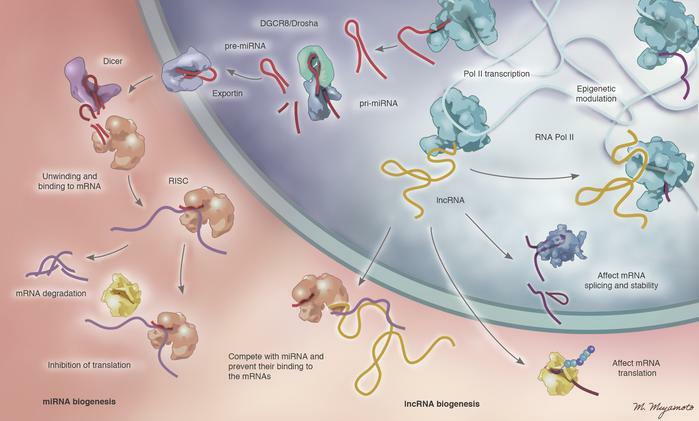 Biogenesis and functions of miRNAs and lncRNAs in PH. (Left) miRNAs are transcribed from the genome in the form of long primary miRNAs (pri-miRNAs), which are then processed by the Drosha/DGCR8 enzyme complex into smaller precursor miRNAs (pre-miRNAs). These small pre-miRNAs are exported into the cytoplasm in an energy-dependent process. In the cytoplasm, pre-miRNAs are acted upon by Dicer to form mature miRNAs. Mature, active miRNAs interact with the RISC (RNA-induced silencing complex), leading to unwinding of duplex miRNAs and binding to the complementary sequence in the 3′ untranslated region. Binding of miRNAs to mRNAs can lead to inhibition of translation or mRNA degradation. (Right) Alternatively, after transcription, lncRNAs can interact with DNA or protein molecules directly, often affecting chromatin structure. lncRNAs have also been described to complex with RNAs, such as mRNAs, to influence posttranscriptional splicing and translation or miRNAs to influence target transcript engagement. Illustrated by Mao Miyamoto.